After a year’s postponement and an unsuccessful year in London, the Transfandgo Ball was back in Manchester and the Boudettes were out in force to welcome this popular event back. It had begun for me a few weeks before the actual event when I had gone shopping to Fonthill Road with Jodie to get our dresses for the Ball. Jodie went for a brown two piece number and I chose a green dress, I also got myself a bag, luckily I already owned a green pair of shoes to complete the outfit. 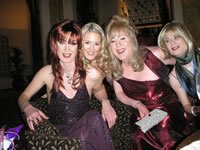 Whilst we were out shopping I met up with two girls that I used to work with who were also out buying party frocks. The ball was taking place in one of the hotels in Manchester and we had arranged accommodation for both Friday and Saturday night at the hotel, which makes it much easier when staggering into bed in the early hours of the morning. As there are a few of us living fairly close together the idea was to go up in a hire car and split the cost, but this proved to be quite expensive and eventually we decided on two cars. Sara drove one car with Tess and me as passengers and Rebecca drove the other with Jodie and Maureen in attendance. Although we set off at similar times and from fairly close by we did not see Rebecca’s car. The journey itself was pretty uneventful, the highlight being finding a Wimpey bar at the motorway service station, at which Sara and Tess indulged, being on a health kick at the moment I opted for a Tuna sandwich. Upon returning to the car Tess was put on navigational duties and proceeded to do a fine job delivering us exactly to the hotel car park without getting lost once. Rebecca had driven the whole way without stopping so had already checked in when I got there, had unpacked and was comfortably seated in the bar with a few of the other gurls. Well rather than missing out on valuable drinking time unpacking my bag, I decided to join the gurls for a beer in the bar. The original idea was that on Friday night we were all going to do our own make up and go out along Canal Street for a few drinks, a meal and maybe a club or two. However, after getting comfortable in the bar, one drink became two, became three or four and then it became a case of some of the gurls wanting to go out dressed and others sticking to guy mode. I opted for the latter and after soaking up my final pint with fruitcake and cheese, I went upstairs to unpack, shower and grab a few hours sleep. I felt much better after the shower and I already for a night on the town, we had agreed to meet in the hotel bar for a cocktail before heading out, and there was an equal split of four of us in guy mode and four in girl mode. The hotel was fairly close to Canal Street in which all the gay and TV friendly places are located, we made a slow walk there and then found a restaurant to eat in. As it was a little it late we were slightly rushed at the restaurant as they wanted to clear the tables ready for turning it into a dance floor later on, from what I remember the food was ok, soup and chicken salad was what I ordered followed by a couple of beers. Alas I was not on the same table as my red wine companion Tess and so it was a beer only meal, once we had finished eating we decided it was time to move on to another bar, I cannot remember the name of it, but it played loud music and sold beer so that was fine. My head felt slightly fuzzy on Saturday morning when I woke up, but after spending 20 minutes in the shower I was ready to face breakfast. A few of the other gurls were up and whilst I watched Rebecca tuck into her eggs and bacon, I had my usual toast with honey and lots of coffee. We took our time over breakfast and by the time we had finished, I only had just over an hour before my make up time. Realising it would be a long day, I made a quick trip to the nearby Sainsbury’s to stock up on provisions to get me through the afternoon. Upon returning to the hotel, I had time to have a shave and gather my lipstick before shooting off to Jodie’s room, as I was first to be made over it was fairly calm in Jodie’s room. The production line was set up Jodie was doing make up. 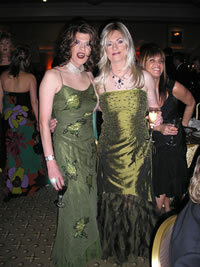 Maureen nails and Gordon who I had met once before hair. After Jodie had done my make up, I sat about talking to a few of the other gurls, waiting for my turn for nails and by the time they were dry, I was ready for my hair. Gordon asked me how my hair was usually styled and then suggested we did something different from my usual straight style, to which I was agreeable. He then proceeded to spend along time combing my hair and the putting curlers into it, as there was no mirror to view what he was doing I just sat there whilst more and more curlers went into my hair. After about 40 minutes he had finished and then decided it would be best if I went back to my room for a few hours with the curlers still in, so with full make up on, hair in curlers, nothing but a denim jacket on top and jeans and trainers on the bottom I made my way back to my room. Luckily I managed to get back to my room, without bumping into anyone in the lift or corridor and once back into my room, I settled down with my sandwiches to watch the Ireland v Wales rugby match. After about half an hour there was a knock on the door, which I took to be Rebecca coming back from here shopping trip, so thought nothing of it and went to open the door. It turned out to be one of the hotel staff come to check the mini bar, I’m not sure which one of us was more shocked he made a hasty retreat and I went back to match. Eventually Rebecca did return and as her make up time coincided with the time I was due to have the curlers taken out, we set off together back to Jodie’s room. Again there was no mirror to view Gordon’s work as he took the curlers out and styled my hair, but when I saw the results I was amazed at the style he had achieved I just did not think it was possible. My only worry was keeping it in place whilst I got dressed and for the rest of the night, but after what seemed like a can of hair spray, Gordon assured me the hair would stay in place. Once back in the room again, we had an hour or two before we had to get ready, so again the remains from my Sainsbury trip were put to good use, as we both had dresses to put we decided to get dressed one at a time, and despite a complicated array of straps we managed to get Rebecca into her dress. It was then my turn, shoes and stockings went on fine, then came the dress, I got it on and started to zip it up, it got ¾ of the way up and would not go any further, I asked Rebecca to help and she managed to get it a bit further, but it still would not budge, it was not to tight the zip just would not move, but she reckoned when the other gurls arrived between them they would be able to get the dress done up, so I continued getting dressed and then called the gurls and asked them to stop off at our room before going down to the bar. A few minutes later the gurls arrived and I explained my predicament to them, I then had the situation of five gurls around me trying to get my dress done up, but even with five of them it still would not move, so I had to tuck a bit of material there and use a safety pin, but it lasted the night and nobody mentioned it so we got by. Once I grabbed my handbag we all then set off for the Champagne reception and the chance to mingle with the other ball attendees, the reception was in the basement of the hotel and it was difficult negotiating the stairs in a ball gown and heels so once we got there we had to indulge in a few glasses of champagne. After a few glasses of champagne and speaking to a few of the gurls who were not part of our group it was time to go through to the main hall for the evenings entertainment and dinner. As in previous balls the Boudoir had two tables which again as in previous years were superbly decorated, each person had their goody bag which contained details of the night’s events and a few little gifts. I sat on a table with Stacey, Sarah, Rebecca, Sara and Tess amongst others, the good news for Tess and I was that there were two bottles of red wine on the table and the rest of the gurls were white wine drinkers. Before the meal began Richard O’ Brien gave a welcome speech and a film was shown by the charity as a way of explaining why we were all at the event. The meal was much better than in previous years, I always get a bit forgetful as to what the food was so again digging deep in my memory bank I think we had goats cheese to begin with, followed by chicken, but I can’t for the life of me remember the dessert, during the meal everybody had been urged to go to the tombola and get a prize, and donate to the charity. I won myself a cuddly toy which became my companion for the rest of the night. Once the coffee had been drunk, I needed a few due to all ready over indulging in red wine, it was then time for us to start taking some pictures, well trannies and cameras appear to go hand in hand, and by the time everyone had taken all the pictures the wanted to take I could only see flashlights in front of my eyes. Once all the pictures had been taken it was the time for the entertainment to begin, and to be honest I’m very vague in my memory about what the entertainment was, I’ll blame the red wine again. To begin with there was a guy who sang big band numbers, and although he was very good, it did not get anybody out of their chairs dancing. Next up was Richard O’ Brien himself with his guitar he played a few numbers and then played the Time Warp which completely filled the dance floor, then there were two girls from coronation street doing a few numbers, not being a coronation street fan I cannot tell you there names, but could they were scantily clad. After this there was another band followed by a Disco, by which time all of the Boudettes were up on the dance floor, dancing away, or as best they could in their heels. At around 1am the entertainment came to an end so we gathered our bags, cuddly toys and the remains of our wine and headed upstairs to the bar, where we stretched out on the sofas took more pictures and continued to drink the night away. At around 3am I decided it was time to go to bed, so I took my shoes and staged in a ladylike fashion to the lifts and then up to bed.